Or, get it for 82000 Kobo Super Points! Questions regarding the nature and appropriate management of cavernous malformation (CM) have clouded researchers and those faced with making clinical decisions for several decades. CMs may be seen as an incidental finding on MRI studies, or they may present with symptoms, such as seizures or intracranial hemorrhage, often causing severe neurologic deficit. Cavernous Malformations of the Nervous System provides a comprehensive and authoritative review of the current practice in diagnosis and management of these cerebrovascular disorders. Emphasis has been laid on the understanding of basic sciences with chapters committed to understanding of CCM1, 2 and 3 genes and their role in CCM biology, as well as clinical genetics. Controversial topics which continue to pose treatment challenges such as safety of anticoagulation and prophylactic management during pregnancy are also discussed. 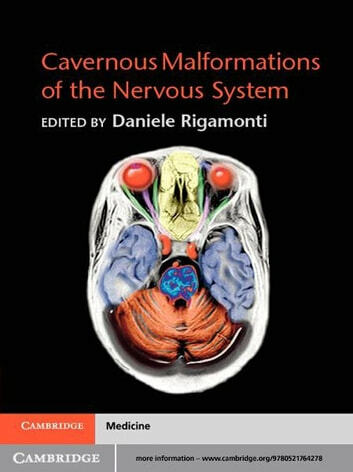 This book will be of interest to basic science researchers, neurosurgeons and vascular neurologists both in academic institutions and private practice.